Lucas March is a Grade 12 student at North Nova Education Centre in New Glasgow, Nova Scotia, and is returning for his second season with the NSYO. Lucas is an accomplished clarinetist and pianist, and has been playing for over eight years. 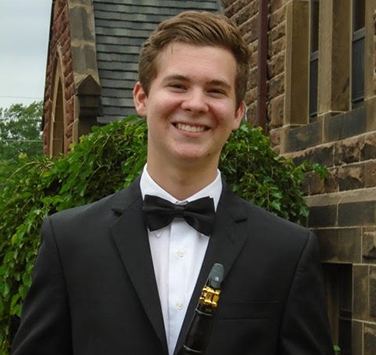 He is currently a member of the Nova Scotia Youth Wind Ensemble, and has also played with the Brock University Wind Ensemble, the Niagara Youth Orchestra, and the Denis Wick Canadian Wind Ensemble. Lucas is a two-time winner of the Friends of the National Arts Centre Orchestra Outstanding Woodwind Player Award, as well as the Rose Bowl and Junior Cup at the New Glasgow Music Festival. He has also received two scholarships from Nova Scotia Talent Trust to attend the Domaine Forget summer music academy and for private study, and is the inaugural recipient of the Hector Broadcasting Scholarship. Lucas has competed as part of Team Nova Scotia at the National Music Festival in 2017 and again in 2018. In his spare time, Lucas enjoys running and spending time with friends.